Professional piercers know how to pierce your belly button best. We look at the piercing process to familiarize you with what to expect and experiences when getting your belly pierced. We also delve into different ways of ensuring bleeding is minimal, getting re-pierced and factors to consider when choosing a piercing needle. A belly button piercing is done on the rim of the navel with a needle. Once the piercing is done, a curved bar is inserted into the hole that has been made and a ball screwed to its end. Belly button piercings require special care to heal. The piercing must be cleaned regularly and kept dry at all times. Beginners in the art of piercing normally wonder how to pierce the belly button. This process takes a very short time. However, the preparation will take some efforts if all is to go well. Proper preparation is necessary if the healing process is to be accelerated whether you are getting it done at a piercing studio or at home. Failure to do this will lead to prolonged healing durations and infections at times. The piercing procedure is best done by a professional piercer. Settle for someone who is registered with the association of professional piercers in your region. Before getting the piercing done, there are a few precautions you ought to put into place. These will ensure that nothing goes wrong. Before we look at how to pierce your belly button, here are a few things you need to know. The piercing is done using needles. It is your work to ensure that these are sterile. Piercing guns are not recommended for belly button piercing as these cannot be sterilized and their mechanism is also traumatizing since a blunt ring is forced to make a hole through the flesh. The piercer should always wear latex gloves. These should be disposed once your piercing is done. With a new piercing, only new jewelry should be used. These should be made of non-allergenic material such as gold, titanium or medical grade steel. In case you are diabetic, experience hemophilia or are prone to keloids you should not get the piercing. Make a pre-visit to your piercing studio before your appointment and make sure that it is a clean place and that you are comfortable with their way of doing things. Once you are ready to get the piercing, set an appointment with your piercer. Discussed below is a step by step guide on what to expect on how to get your belly button pierced, these apply when doing it on your own or when it is a piercer doing it. Start off by cleaning your hands using soap and hot water. Once done put on your gloves. Prepare the table or counter top that you will be working from. Use a disinfectant to clean it up. Get all the things you need ready. If you are using a new kit, it is possible that they will be sterilized. However it is advisable to sterilize both new and old piercing equipment before use. Put some rubbing alcohol in a shallow bowl and submerge the equipment. This includes jewelry and the needle. In the absence of a bowl, soak a cotton bowl with the alcohol and rub it thoroughly on the equipment. Pick your preferred point of piercing. The most common of this type of piercing is the upper rim piercing. A bottom belly button piercing is also possible to get. You can use a body marker to make a spot on the points where the needle goes in and out. A mirror may be of help with this. The rim and exit point should be four inches apart. Once done deciding where the piercing goes through, clean up the belly button thoroughly. Use some rubbing alcohol to disinfect all around the navel. Rub a clean cotton ball soaked in alcohol around each time using a new one. To make the site of the piercing numb and have the process proceed painlessly, wrap up some ice in a paper towel and hold it on the belly button for around two minutes. Numbing spray can also be used for the same purpose. Pick up the clamp and use it to hold up the flesh with the point of piercing in between the openings. In case you are doing it without a clamp, use your hands to hold the point of piercing carefully in a way that will not have your hands getting pricked by the needle. Pick up the needle and push it slowly through the marked points from the bottom to the top. As you insert the needle, ensure that you keep on breathing. At this point, you may see some blood drops. This though does not happen in everyone. Get the needle out and immediately insert the jewelry. When the needle is removed, the hole starts to close up immediately. As a result, it is important to carry out these two steps in quick precision to avoid pain. At the moment there are some hollow needles to which you attach the jewelry. These are easier to use as the skin will have not room to retract. In case you are looking for ways on how to pierce your own belly button, it is important for you to note that people who try to do the piercing on themselves often get undesired consequences. It is almost impossible to do it at home without hurting yourself and you are likely to experience undesirable pain, inflammation and infection. Where it is done close to the skin surface it may result in rejection and migration while too deep a piercing may result in longer healing periods. Instead of getting it done at home, treat the piercing as some sought of surgery that could only be done by a professional. This way, you will only be left with the responsibility of the belly button piercing aftercare. In case this does not sound like what you want and you are still determined to do the piercing by yourself, ensure that you conduct the procedure in a hygienic place. Your equipment should also be right and sterile. To conduct the piercing without pain and make sure it is not distorted make proper use of a mirror. Use standard body piercing equipment. In case you are doing it without a kit, ensure that you have the essential equipment. You can purchase these in pieces for your personal use. Never try to pierce your navel with an earring or with a gun. Other crazy things that people use while piercing the navel at home ad which should be avoided include conducting the process with a sewing needle or with a safety pin. While these will pass through the skin, they will cause skin to retract. There is also a possibility of getting infections from using such equipment. Once all set, follow this guide on how to pierce your belly button step by step. Before getting a belly button pierced, you should make sure that the piercer explains clearly to you what the risks involved are. Generally, persons who wish to get a belly button piercing before they get to 16 years of age will be required to take a parent or guardian with them. This is necessary because you will be required to sign a consent form. At times, the piercing is a parent’s choice. At what age can you make this decision for your kid? Although some will get it as early as at 10 years old, you may want to scrutinize if your kid is ready enough to take the responsibility of caring for the piercing. At this tender age, the kid is playful and may be careless. The piercing pain could also be unbearable for them. Evaluate your options and see if you can wait a little bit longer or if you should go ahead with the process depending on what you know about your kid. By the time your kids get to teenage at 13 and at 14, they will have started falling in love with things they can associate with. This could include body modification part of which belly button piercings are. While some parents may be reluctant in giving consent for the same, teenagers are a determined lot. You may want to talk to your daughter on the responsibility that comes with the piercing. Sit them down and reason with them. Find out if they want to do it out of peer pressure or love for the piercing. Depending on your evaluation of the situation, you may grant them permission to have it pierced. Remember failing to grant them permission may make them want to defy and do it their way. This could have them getting the piercing from unprofessional piercers who only mind the money and not parental consent. For some people, the piercing is meant to celebrate some milestone. Most women will get a belly button piercing after weight related accomplishments. It is not a wonder then that you may be tempted to get one after a tummy tuck. For any piercer to agree to the piercing, the area around must have enough amount of skin for the piercing to go through. Doctors recommend that you wait at least two months after the surgery before considering a piercing. Your personal surgeon should be in a position to advice against or for the piercing depending on your post operation progress in the healing process. The longer you wait before getting pierced the lesser the complications you are likely to get and the faster the healing process for the piercing will be. When getting the piercing, you will need to ensure that the right jewelry is used. The piercing also ought to be done by a professional or else you will have to get it done for a second time if it appears crooked. This can be quite painful. Since belly button piercings are meant to be seen, you may consider getting it done during the winter or spring so it can be healed in summer. This comes with the advantage of allowing you to go swimming as well as avoid infections that may be brought about by sweat accumulating around the piercing. Heat also accelerates bacterial growth which can be counterproductive to the healing process. When done early enough, chances of getting the piercing twice as a result of infections during the summer are eliminated. A common question concerning piercings normally is; can you re-pierce your belly button? Some people also love to know if a re-piercing hurts more than the initial piercing. If for some reason you are not satisfied by your current piercing, you can have a re-piercing. There are a few things to keep in mind when doing so though. Even with a piercer who puts all their expertise into the process, it is still possible for the new piercing to cross paths with the old piercing’s scar tissue. With the piercing going through the scar, you are likely to experience more pain. Also be aware that it is important to take care of the initial hole as you let it close up awaiting a re-piercing. Continue caring for it by cleaning it up as it closes. This will help make sure that not too much scarring occurs as this could outshine the current piercing. Once you get your piercing done once more, be certain to take care of the second piercing. Be committed to the after-care to ensure that the healing process takes place smoothly. In case you removed the jewelry as a result of rejection, there is a possibility of a re-piercing as well. Before you proceed, establish what the causes of the rejection were. It could be that the piercing was done too close to the skin’s surface hence the body pushing it out as it healed. Also ensure that there is no keloid formed after rejection. It all is okay, go for it and ensure it is done by a professional. Before you get your navel re-pierced, your piercer will observe the area and determine if it is fit to be pierced once more. If it is not, they will let you know. This is more so where they foresee complications. If you qualify, they will examine the already healed area to determine whether the second piercing will be done in the same point thus go through tissue scar or if it will be done beneath it. In most cases, where the piercing is being done after it is rejected, the piercer will opt to pierce beneath the initial one. Belly button piercing kits contain everything necessary to conduct a body piercing. This is something that any piercer needs to get started. Piercing kits will include sterile standard navel piercing needles, a clamp, belly jewelry, alcohol prep pads, a pair of latex gloves and a body marker. If you are looking for a self belly button piercing kits, you can opt for one that also comes with paper towels, surface disinfectant, antibacterial soap and rubbing alcohol. There is a variety of these kits in different shops such as Claire’s, ebay and even at Walmart. Some are as cheap as $5 for a five 10 pieces kit while a 15 pieces kit goes for $15. These come with free shipping in some areas. You can visit the websites to see if you are among the target areas for free delivery as you compare the prices so you can decide where to buy your kit. A piercing needle is the single most important tool in the whole process. Without a belly button piercing needle, the process may be tedious and fail to turn out as expected. The best piercing needles should be laser sharpened for maximum effectiveness. This will ensure that they are smooth enough to carry out the piercing without harming the skin. At the point of purchase, the needle should be sterile and prepackaged. Other than getting needles as part of the piercing kit, it is possible to get them being sold separately. At times, the needles and clamp will be offered for sale as a package. Piercing needles come in different gauge sizes starting from gauge 12 being the largest and 24 being the smallest. 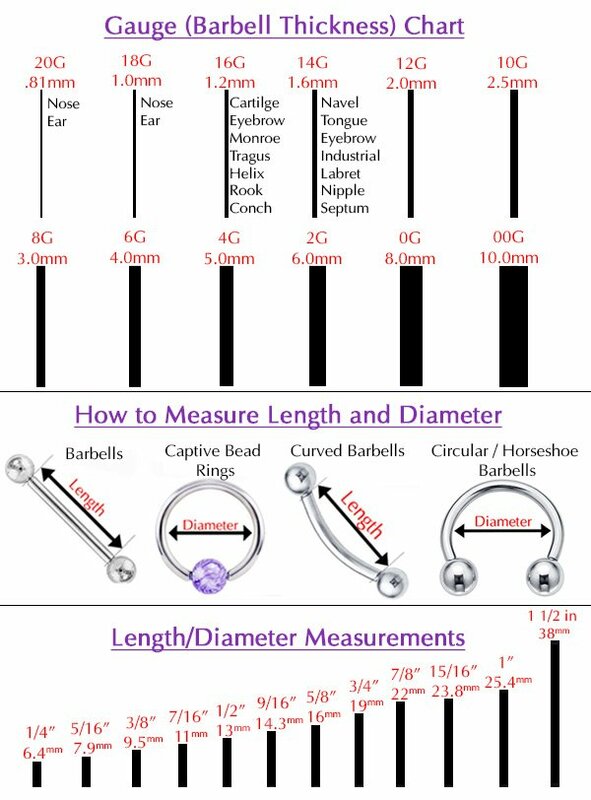 Given this range of sizes, how big is a belly button piercing needle? Most navel jewelry are 14 or 16 gauge in size. To have it easy choosing jewelry, it is important to get pierced using a needle of either size. Piercing needles should be hollow to provide for a less painful method of getting the jewelry into the piercing. Where a piercing needle is not available, do not opt for a standard needle. The needle should also not be substituted with the use of jewelry to pierce. A belly button piercing bleeding may be as a result of a number of things. Right after the piercing is done, some people will bleed. This though does not happen in everyone. After around a month the bleeding should have stopped. The bleeding should be for a short time only. To ensure that it is minimal, piercees are advised not to get the process done if they are on blood thinning medication. Where this is the case, the bleeding could be a lot which is dangerous. In case there is bleeding any other time, there could be a problem. When the piercing is infected, it will start swelling and pussing. This is a sign of a slight infection. In case the infection is not dealt with, the piercing may with time start bleeding. This is an indication of advanced infection and may be accompanied by a yellowish-green discharge. To prevent the infection from forming an abscess, you will need to see a doctor as fast as you can. Infections are common during the secondary healing stage. This can be after two, three or four months depending on your skin’s healing ability. Other than an infection, your piercing may bleed if it is subjected to trauma. This could be from something as minor as your clothing or as major as getting you belly knocked on a wall. It is also possible to scrape the piercing in the process of changing the jewelry. In case you are used to lying on the stomach, you will have to stop this as it could be traumatizing the piercing. Bleeding from trauma can occur even after a year when you think it has healed and can endure stress.